Ethyl Alcohol vapours mixed with air are passed over silver catalyst maintained at 450°-500° C. The reaction products are condensed. Uncondensed gases are sent to two scrubbers in series to recover aldehyde and alcohol. The condensate and the absorbate thus obtained is sent to a distillation column to obtain pure aldehyde product form the top. The bottom consisting of alcohol-water mixture is passed through reactor tubes in order to recover the heat of reaction. The vapours formed are sent to the aldehyde distillation column and the over flow liquid is sent to another distillation column to recover unconverted alcohol which in turn is recyled through Carburattor. 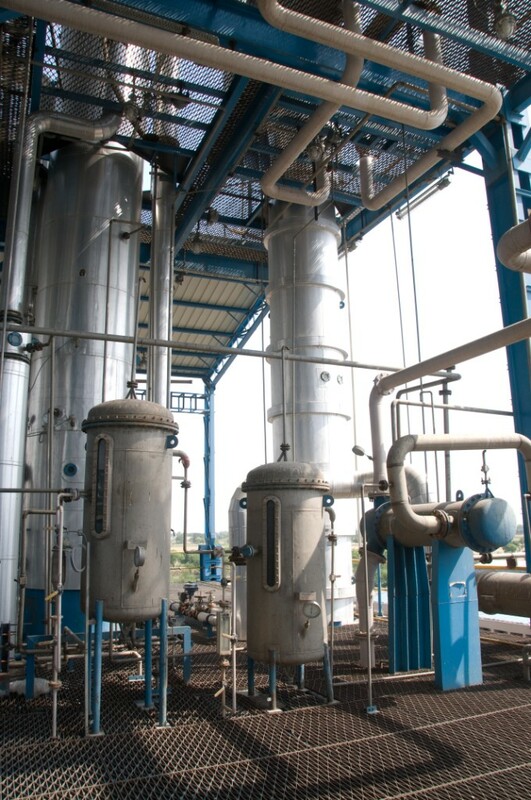 The process is operated at elevated pressure so as to increase the boiling point of acetaldehyde and thereby the necessity of using chilled water for aldehyde condensers is eliminated. The product Acetaldehyde is stored under inert gas N2 blanket. Ethyl Alcohol 100% 1150 Kgs. Dry Saturated Steam at 8 kg/cm2 2500 Kgs. Applications for the manufacture of the following chemicals. 1150 kgs.